Since we arrived in Nicaragua last Monday, I have been bombarded by many sights, experiences and opportunities that are quite different from my normal life in Kitchener, Ontario. I wish I had about twenty pages to tell you about the many experiences, hopefully we will have opportunity to share more when we return. 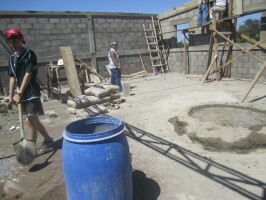 I have spent most of the daytime working on the construction project at the church in Leon, so I will share about that. The walls have been completed up to the top of the second floor, the roof joists and steel channels have been welded in place (not by us in case you were concerned) and I believe the corrugated steel roof sheets are planned to be installed over the next couple days. Walls on the first floor have been painted, and a multiuse concrete ramp constructed to improve access to the church. One of the things you don’t often see in Kitchener is a bunch of guys mixing up a big pile of concrete (not sure if it was six or eight, 42.5 kg bags of cement plus sand, gravel and water) in the middle of the street. Taxis, motorcycles, bicycles and horse drawn wagons all just cruising on by. Well, we were actually only taking up half of the street. Anyways it was pretty awesome, a guy thing. It has been a blessing for me to be a part of making these practical and physical improvements to the church building. However, I am really aware, and want to tell everyone, that special thanks really needs to be given to everyone who contributed to help purchase the building materials for the project. The local people could do the work here without us being here, but without the materials there would be nothing to build with. I believe the contributions for building materials really will make a practical benefit to the church in Leon. Thanks to everyone who contributed to purchase building materials. It has also been a blessing to build relationships with Sergio, Fernando (Sergio’s son), and Luis, who have led the concrete and masonry, as well as the welders, Lupé and Marvin, all who we have worked with and ate lunch side by side over the past week and a half. 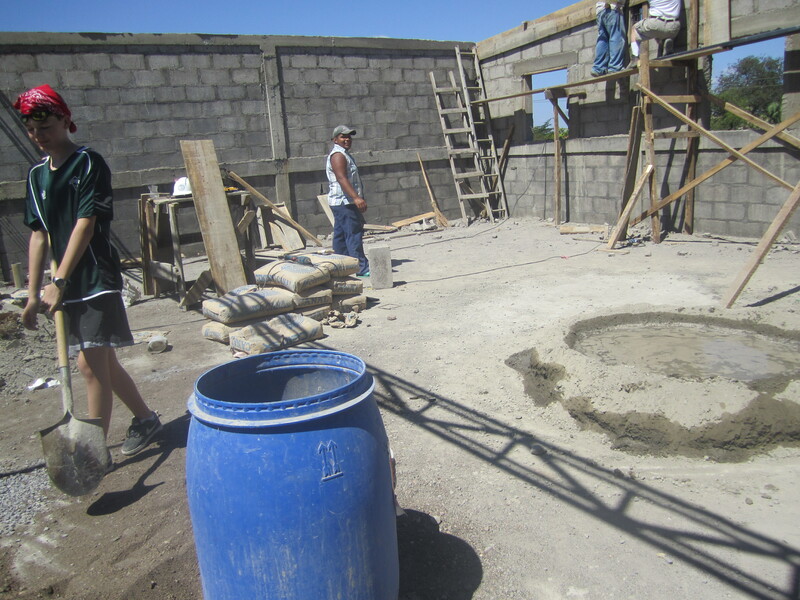 Now that the concrete and masonry work is done, Sergio and Fernando went back home to their families. During the construction they had been living at the construction site, sleeping on a concrete floor under the stars. Before they left we had prayer together and a brief time of sharing. It is great to know that if we do not see our brothers again in this world we will see them in Heaven. I just want to share a couple of verses from Zechariah 4, that the Lord has placed on my heart this week (if you have time read chapters 3 and 4). First, Zech. 4:6b, “It is not by force or strength , but by my Spirit, says the Lord of Heaven’s Armies”. Which is reminding me that it is not in our efforts that God works, but by His power and through His Spirit. Secondly, Zech 4:10 “Do not despise these small beginnings, for the Lord rejoices to see the work begin”. My prayer is that the construction work and the kids program would somehow be a “small beginning” that the Lord will bless and use to do His work in Leon, in our lives, and around the world. So good to read your message, Karl. I have the daunting responsibilty to facilitate my Housechurch in learning & discussing the Holy Spirit. I will use your comment . Thanks! Take care of yourself & stay safe. Just know you’re not shoveling snow while sweating “down there”!!! Karl, thanks for sharing what life is like there. It is so great to hear the stories and experiences of the team! We are thinking of you on your last day on the site. Karl, it is really great to hear more about your experiences and perspectives. I for one appreciate these blog postings from the team members, and this one is no exception. It really helps to give us a better appreciation for what you are seeing, experiencing, participating in and affecting, and what is affecting you. Thanks for sharing.